The Panasonic Bicycles Virtual Museum featuring catalogs, photos, specifications, and more. Welcome to the Panasonic Bicycles Virtual Museum (PBVM). Please be aware that this web site is in no way associated with Panasonic Bicycles Japan, therefore we don’t handle parts replacement, warranty or any other customer support related service. This site was conceived and built by a private collector of Panasonic brand bicycles in the Minneapolis, Minnesota area. It seemed as if every other brand of bicycle had some sort of site or registry dedicated to it except for Panasonic. Why did Panasonic have only one or two mentions elsewhere? Naturally when you mention the Panasonic brand the vast majority of people think of electronics, especially here in the United States where the bikes haven’t been officially sold since 1989. Elsewhere in the world Panasonic bicycle production carries on. Those who have been lucky enough to own and ride Panasonic brand bicycles know what a great value they are in terms of both ride and quality. We developed this site in order to preserve a photographic history and information pertaining to Panasonic’s bicycle production and sales. 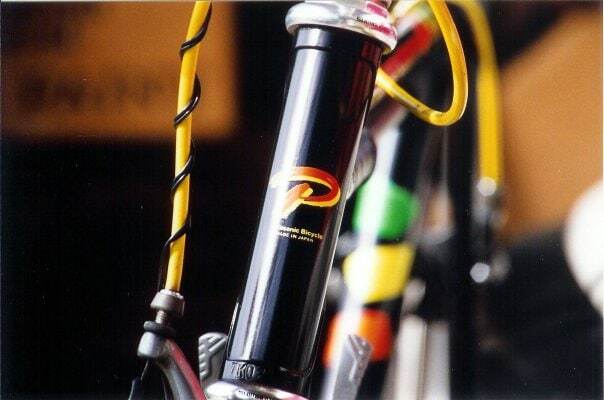 We’ve become a resource for owners, collectors, and restorers of Panasonic bicycles from around the world. ATTENTION Non-USA Residents! We are in need of your old Panasonic Bicycles catalogs from any year you don’t see documented on our site. Please contact us if you have some you can scan or loan to us for scanning. See those social media icons floating at the top left corner of your screen? Use them to connect with us via your favorite social media platform! We frequently post interesting bicycles that we find for sale from around the country and world as well as discuss other aspects of these fine bicycles. Our Facebook page is the most active with over 1000 members however Facebook, Google+ and Twitter all receive our update postings. Want to help support the PBVM? We’ve reached the limits of our current web hosting environment so we need to upgrade to something more robust. In order to do this, we need to raise at least $600 USD to jump to the next level for the next year. We’re in the midst of remodeling the PBVM web site to improve navigation and multi-device usability. We’ll be doing away with the off-site hosted image galleries and Flash player requirements and moving everything on to our primary server. The new site layout will also work much better on tablets and mobile devices. Our new site will have all new responsive page layouts with all images located on the PBVM server. No more flash slide shows. Our menu and page structure will be much more accessible to mobile viewers! Own a Panasonic or National Bike?